Pilgrimage, written by Jamie Hannigan and directed by Brendan Muldowney, is an Irish medieval thriller that packs a much bigger punch than its $5.8 million budget. With its majestic landscapes of Connemara, Ireland shot by cinematographer Tom Comerford, linguistic multiculturalism, and compelling battle scenes, Pilgrimage commands instant respect. The movie opens in Cappadocia, Turkey in the year 55 AD and depicts the graphic stoning of Saint Matthias. The moonrock-looking stone that ultimately kills him becomes a powerful Christian relic, which is thought to have protective and salvific qualities. The film then flashes forward to 1209 AD in Kilmannan, Ireland (probably present-day Wexford) where a group of monks tasked with safeguarding the relic live peacefully along the western shore. Soon, a papal representative, Geraldus, visits the monastery and explains that the Pope has requested the relic be sent to Rome. After ominously warning Geraldus about the dangers of transporting a powerful object across a war-torn land, the Abbot agrees to release the relic and designates a handful of monks to accompany him on a pilgrimage to Rome. Among them is the young monk Diarmuid (Tom Holland) and his silent companion, the Mute (Jon Bernthal). Predictably, trouble awaits after the group meets up with the Norman Baron De Merville’s army and is betrayed by the Baron’s son Raymond who convinces a local pagan tribe to ambush the group and steal the relic to be used as a bargaining chip against the Pope. The remainder of the storyline involves the transformation of the quiet Mute, who had once been a Crusader, into an unstoppable killing machine as he leads Diarmuid and Geraldus on a journey to recapture the relic and escape from Raymond’s men. 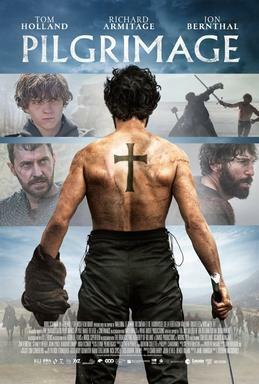 The movie culminates with the Mute saying his first word, “hell,” seconds before gruesomely killing Raymond, and Diarmuid throwing Geraldus and the relic overboard from their rowboat. The film’s premise, which depends on the sacred and political power of a relic, creatively expands upon the narrative behind the death of Saint Matthias as a way to lend significance to the overall story. Saint Matthias had been chosen by the apostles as Judas’ replacement and went to Cappadocia to spread Christianity. Although Pilgrimage opts to go with Matthias’ stoning in Cappadocia, there are several theories as to where and how Matthias died. Although the stone that killed Matthias is not actually an important relic in Christianity, Christian history often involved sacred relics that were believed to have powers and could be used to wield influence, and the film uses that history to comment on medieval Christianity. To add depth and complexity to a baseline narrative involving the transportation of a rock from one point to another, Hannigan layers it with religious symbolism, which went largely unnoticed by critics. The exception was The New York Times’ reviewer Ken Jaworowsky, who briefly noted that “Pilgrimage raises a question or two about unexamined beliefs and religious zeal.… [T]hose who can stomach them will receive some dark rewards.” Most of the critiques of the movie involved its cinematography and how quickly the plotline moved. Throughout the movie, the audience is bombarded with symbols of Jesus, Judas, and the devil. Specifically, the Mute has a cross tattoo on his back, often carries supplies as Jesus would carry the cross, but also does not speak and therefore cannot repent for his sins and ultimately proclaims that he comes from hell. Likewise, the character of Geraldus is a literal example of the Church’s corruption and power but is seen in the final moments grasping Diarmuid, saying “The devil has you boy!” before falling to his death into what resembles the pits of hell. With this said, when asked why audiences should go see Pilgrimage not even Hannigan mentions the compelling nature of the movie’s religious tension. Ian Cairns, “Pilgrimage (2017),” Medieval Hollywood, accessed April 24, 2019, http://medievalhollywood.ace.fordham.edu/items/show/20.